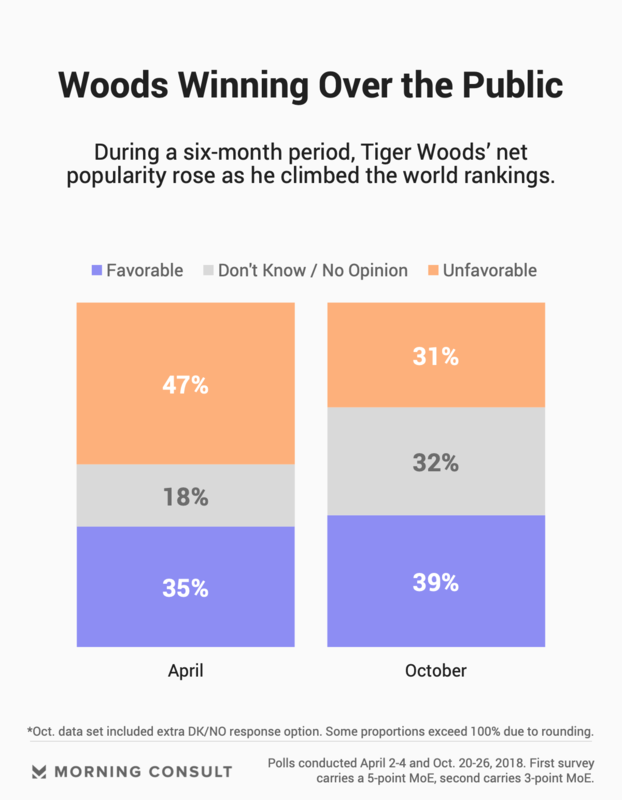 Woods’ popularity has grown since a pre-Masters April poll. 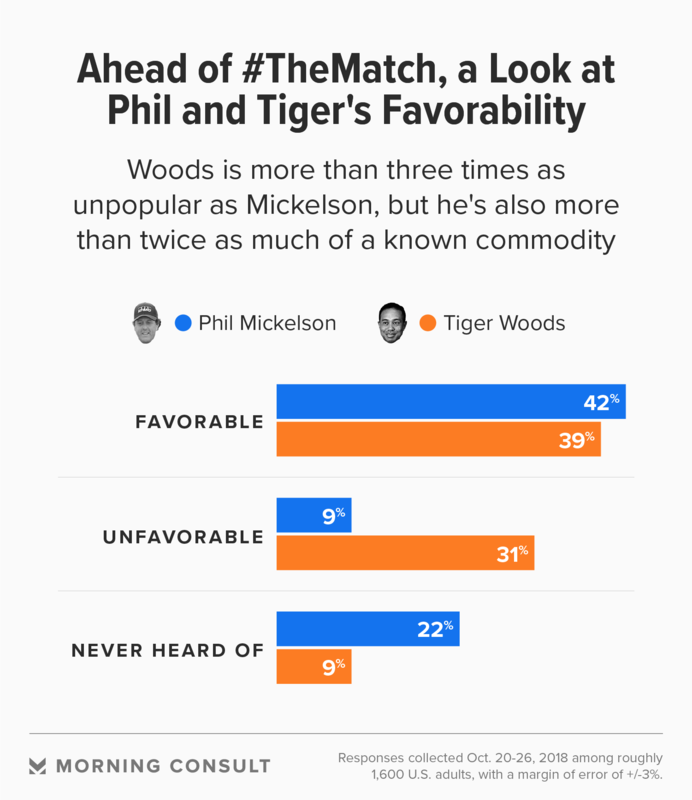 Ahead of “#TheMatch,” 39% view him favorably and 31% unfavorably. 42% view his competitor, Phil Mickelson, favorably. Few athletes in American history have experienced a fall from grace like Eldrick “Tiger” Woods. With 14 major championships — four behind Jack Nicklaus for the all-time record — Woods has spent much of the past nine years trying to get back to the top following an infidelity-fueled, high-profile divorce and a series of debilitating injuries that derailed his 10-plus years as the most dominant and marketable player in any sport. But Americans love a comeback story, and perhaps more importantly, they love winners. As Woods and fellow golf star Phil Mickelson prepare to tee off Friday in Las Vegas for “#TheMatch,” the first-ever pay-per-view golf contest, Morning Consult polling from April and October suggests the American public may be ready to give the self-described “Cablinasian” another chance. Positive sentiment toward the 14-time major championship winner has jumped since Morning Consult first asked 400 U.S. adults their opinion of Woods in an April 2-4 survey conducted just before the Masters Tournament in Augusta, Ga., where Woods was making his first appearance in three years. That survey, which carried a 5-point margin of error, came as the green shoots were beginning to show in Woods’ game. A little less than a month earlier, he’d finished one stroke behind winner Paul Casey in the Valspar Championship in Florida, Woods’ first top-five finish since 2013. At the time of that survey, 47 percent of adults said they had an unfavorable view of the former habitual world No. 1, compared with 35 percent who had a favorable impression. But public opinion has risen alongside Woods’ climb up the world rankings, from a career-low No. 1,199 in December 2017 to No. 13 as of Nov. 18. In the latest Morning Consult poll, conducted Oct. 20-26 — after Woods’ Sept. 23 win at the Tour Championship in Georgia, his first victory in five years — 39 percent of respondents said they had a favorable impression of him, with the share of adults viewing him unfavorably dropping to 31 percent. The survey of 1,583 people carried a 3-point margin of error. Woods’ improving public opinion has dovetailed with increased interest in the PGA Tour, with his appearances exciting golf aficionados and marketers alike. A July analysis from news site Sports Media Watch found that of the 20 rounds Woods had played earlier in 2018 that were shown on television, all but one posted an increase in ratings and viewership compared to the prior year. Later that month, with Woods in the hunt, final-round coverage of the British Open scored a 5.0 Nielsen overnight rating, the highest Sunday number for the tournament since 2000, according to Forbes, when Woods completed his career grand slam at St. Andrews’ Old Course. It was a similar story at the Bellerive Country Club for the PGA Championship in August, when Sunday ratings were up 69 percent from the 2017 tournament and the highest since 2009. The PGA and Turner Broadcasting are hoping to turn that heightened interest into revenue this week, with U.S. fans forking out $19.99 to see two of the game’s greats compete for a winner-take-all $9 million prize. While Woods has enjoyed a surge in popularity this year, Mickelson, who has remained scandal-free, is still significantly more popular. Forty-two percent of adults in the October survey said they have a favorable view of the five-time major champion, compared with just 9 percent who had an unfavorable view. But the survey also served as a reminder of Woods’ marketing reach: 22 percent said they’d never heard of Mickelson compared with 9 percent who said so about Woods.